This is my twist on a traditional West Asian flatbread, adapted from a recipe by The Spruce. I used instant yeast and let the dough rise overnight in the fridge; the longer dough ferments, the more flavorful it becomes. 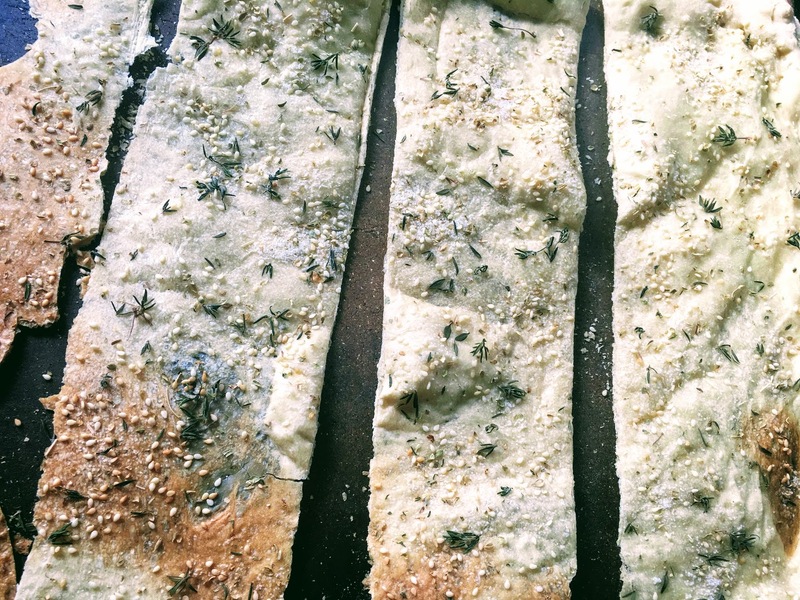 I brushed the surface with egg white and topped it with a mixture of dried and fresh herbs inspired by za’atar, a Middle Eastern spice mixture (in the Levantine region, za’atar is used to coat a pizza-shaped flatbread called manakish.) Lavash is a staple bread in Armenia, Turkey, Azerbaijan, and Iran, but is also eaten throughout the Middle East. Traditionally prepared in a tandoor oven, it can be soft or cracker-like, depending on cooking time. Mine starts out soft but becomes crisp as it cools. Serve with dips such as labneh or hummus. Place warm water in a large mixing bowl. Add yeast and honey , stirring gently to dissolve. Set aside for a few minutes, until foamy and bubbly. Mix in flour and salt until a dough begins to form. Directly in the bowl or on a lightly floured surface, knead for around 10-15 minutes, until dough is smooth, elastic, and springs back when touched; sprinkle with more flour as necessary if dough is too sticky. Cover bowl with a towel or plastic wrap and set aside to rise for at least two hours. If planning to let the dough rise overnight, place dough in a gallon-size ziploc bag and refrigerate. Remove from fridge the next day and set aside for around 10-15 minutes to warm up. Preheat oven to 475 °F. Divide dough in half. Roll or stretch each half into a large, thin rectangle, around 11 x 14 inches, and place on two pizza stones or parchment-lined baking sheets. (If you have one pizza stone, bake the bread in two batches.) Variations: For bread that has both soft and crisp sections, stretch dough by hand and make edges a little thicker than the middle. 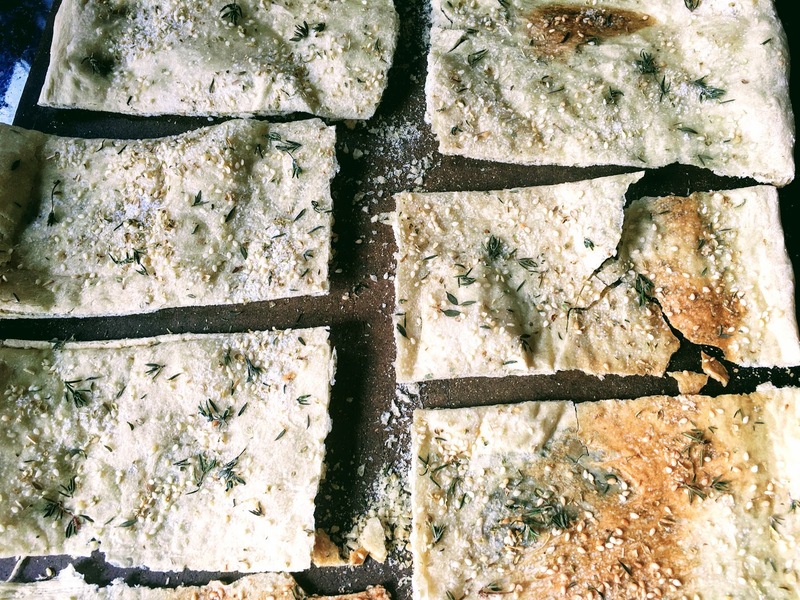 To make fluffier, thicker flatbread, divide dough into 8 pieces. Shape each piece into a long oval or a 3 x 10 inch rectangle and place an inch or two apart on pizza stone. You will have to bake the bread in two batches. Using a pastry brush or a spoon, brush the dough with egg white. In a small bowl, stir together sesame seeds and dried oregano. Sprinkle mixture evenly over the flatbread. Sprinkle on sea salt and fresh thyme. Bake for around 20 minutes, until edges begin to turn golden brown. Let cool for a few minutes, and then cut into rectangles with a pizza cutter. These are best eaten the day they are made, but can be stored in a ziploc bag or airtight container at room temperature.